To get everyone ready for the virtual minimalist challenge this Saturday (if you haven't RSVP'd, check out the Facebook event! 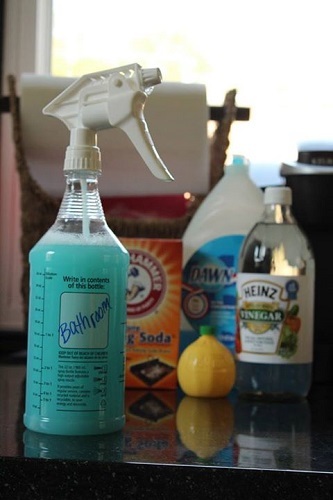 ), here's a great way to minimize your bathroom cleaning products. This all-in-one bathroom cleaner really does the trick AND it only takes a couple of products you probably already have sitting around the house. Add the baking soda and vinegar FIRST and let it fizzle out before adding the rest of the ingredients (it will foam if you don't). Add the remaining ingredients, squeeze out the suds, screw on your cap and you're ready to clean! Clear all surfaces, then spray down everything (sink, counter, mirror, tub, toilet, etc.) Let it sit for a few minutes before wiping it down with a cloth. Don't forget to rinse out the tub so it isn't slippery!